renaissance town in Italy. Particular.Urbino. Obelisc. Ducal Palace.Originally this obelisk was erected as a pair at Sais by Pharaoh Apries in about B.C. 580. (The companion to this obelisk is now in Piazza della Minerva, Rome.) 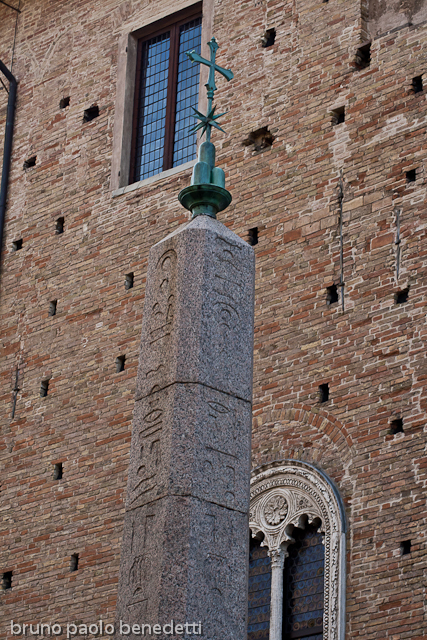 This obelisk was transported from Sais to Rome in A.D. 90, and it was used for Iseum. Picture with flat perspective. Wide depth of field. On foreground the obelisc with inscritpions . On backgourn ducal palace wall with mullioned window with two lights at bottom right and a window top left. The obelis covers a little part of wbottom window left side. Oblique perspective with angle to right.